I’m not entirely sure what I think about this issue. On the one hand it dares to go places most creative teams don’t – breaking down the barriers between the creator and the creation, by placing Fraction, Allred and editor Tom Brevoot into their own comic; for the most part making it an enjoyable and silly tale. On the other hand, this story can feel a little too much like one big inside joke, and does require a working knowledge of each of these characters to fully appreciate. To be fair, a lesser day in the issues of FF is still nothing to sneeze at, and the team manage to create a book that still stands out, if for sometimes the wrong reasons. 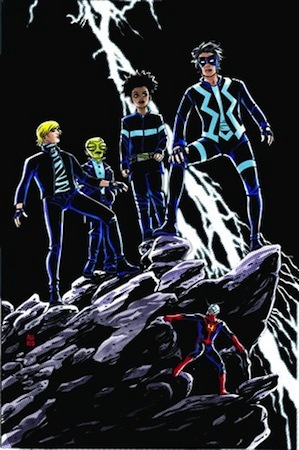 The issue is split between two stories, one with the more outcast members of the FF engaged in twenty questions with a madman as one of their own is forced to kill the old man who may-or-may-not be Johnny Storm, and another as the rest of the members take a microscopic field trip with the Marvel creative team. The aforementioned game is great and still manages to live up to the standard seen in previous issues, but the field trip does seem to feel a bit out of place. Full of inside jokes and references to the team’s social media presence, like Tom Breevot’s Formspring, this issue isn’t really aimed at anyone who hasn’t got anything more than a cursory knowledge of these people. Thankfully, the accompanying FF members remain fun, with Scott Lang’s dialogue reminiscent of an actual parent – remaining empathetic and dismissive, especially regarding the children’s love of the tiger. It speaks volumes of the character – a man who has lost his child and is beginning to let these few take her place, and Fraction really hits the nail on the head here. The other half of the issue is great, letting the other characters shine. Tong in particular is a character that continues to grow, following her change earlier in the series, and is becoming a larger and more fun part of the team. Alex is still battling between saving his parents, and betraying the FF. What else can I say about the Allreds that hasn’t been said already? They are great, plain and simple, and this issue continues to be a large selling point. I really cannot speak any more highly about those two, and I love coming back to them each week. Despite a very risky choice taking place in the issue, it still manages to be a great read. I’m glad that this team is making choices like this, and while FF #10 doesn’t hit all the right notes, it still manages to sing strongly.